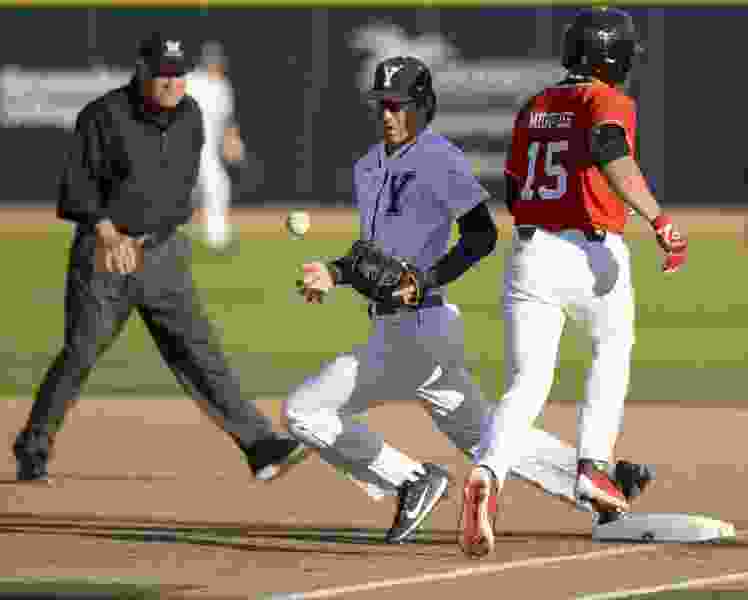 (Leah Hogsten | The Salt Lake Tribune) BYU's Brian Hsu, pictured here with Utah's Erick Migueles, is one of the few returning starters on the Cougars' 2019 baseball team. Provo • After a season in which his BYU baseball team failed to reach expectations, was riddled by player dissent and “guys not buying in,” coach Mike Littlewood cleaned house in the offseason. The Cougars, with 17 newcomers and three recently returned missionaries on their 35-man roster, begin the 2019 season Friday with a three-game series against Northwestern in Mesa, Ariz. Having gone a disappointing 22-28 last year, and 11-16 in the West Coast Conference, which left it out of the four-team WCC tournament last May, the program is looking to rebound in a big way, the seventh-year coach said Monday. The goal, said the Cougars’ best returning position player, senior outfielder Brock Hale, is to find the chemistry and cohesion that helped the 2017 team win the WCC tournament and make it to the NCAA regionals for the first time in 15 years. Hale hit eight homers, drove in 31 runs and led the team with a .342 batting average last year, but he didn’t get much help. The Cougars weren’t awful last year — 10 of their losses were by one run — and they showed some flashes, but injuries to some key starting pitchers early in the season sent them reeling and they never really recovered, Littlewood said. Junior Daniel Schneeman and sophomore David Clawson were drafted and are now in the minor leagues; Kyle Dean, the highly recruited slugger from San Diego, said on Twitter that he was not invited back, and is now playing at Cal State Monterey Bay. Sixteen other underclassmen from the 2018 roster are not on the 2019 roster, for one reason or another. For instance, Colton Kent, son of former Major Leaguer Jeff Kent, transferred to the College of Southern Idaho in search of more playing time. The Cougars are picked to finish sixth in the WCC by the league’s coaches, who never give them much respect, but Littlewood isn’t fazed, saying the coach’s predictions “rarely work out that way in the end.” He said the coaches probably don’t realize BYU has a handful of players back from church missions who will make an impact, including probable starting center fielder Danny Gelalich and infielder Jackson Cluff, who hit .279 as a freshman before serving in Atlanta. Pitching is huge in college baseball, and Littlewood said the Cougars have more depth on the mound this year. Senior right-hander Jordan Wood, BYU’s only all-WCC preseason pick, besides Hale, will be the staff’s ace. Sophomores Justin Sterner, a returned missionary, and Drew Zimmerman will also gets starts this weekend. Redshirt freshman Ryan Brady, a former Park City ace, had Tommy John surgery last year and will join the staff in March. Quarterback Jaren Hall of the football team will give baseball a shot this spring, while working around his spring football camp responsibilities. Littlewood brought in Arizona assistant Michael Bradshaw to be his full-time pitching coach, and he said the benefits of that are already visible. That longed-for change in culture?